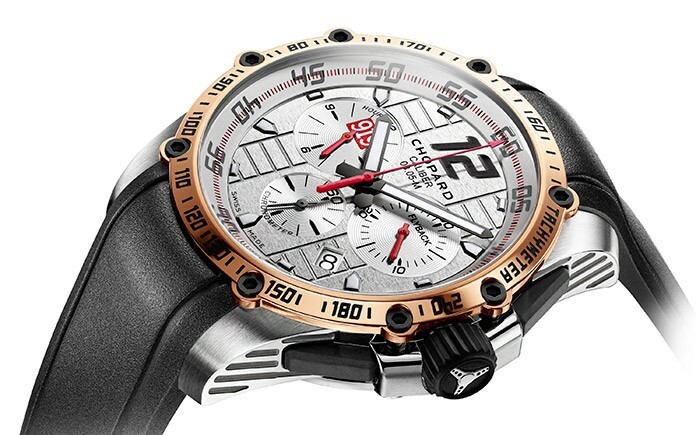 Chopard presents a Superfast model in a limited series dedicated to the victory of the Porsche Motorsport team in the 2015 World Endurance Championship. The German racing team for which Chopard has been serving as Official Timing Partner since 2014 thereby won its 17th title, marking a triumphant return to endurance competition. 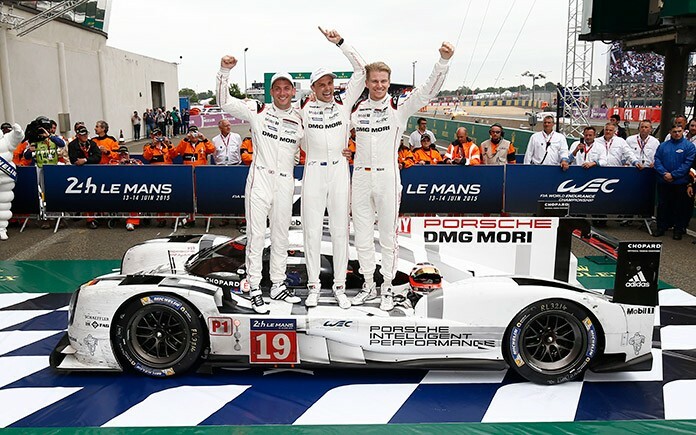 This trophy was won at the wheel of an exceptional car – the Porsche 919 Hybrid – of which the Superfast Porsche Motorsport 919 – limited victory edition reprises the design codes. Issued in a 17-piece limited edition, this new sleek sophisticated, COSC chronometer-certified chronograph celebrates this victorious partnership. Since 2014, Chopard has been accompanying Porsche Motorsport’s return to the FIA World Endurance Championship (WEC). As official timing partner of this legendary team, the watch manufacture is particularly proud to celebrate the year 2015 which was crowned with success and to honour this victorious season is presenting a limited series. Porsche claimed the World Endurance Manufacturers’ Championship by racking up a string of podium finishes throughout 2015. The most impressive was undoubtedly its double victory in the 24 Hours of Le Mans last year that was one for the history books. This 17th World Championship title further reinforced Porsche’ impressive track record in endurance racing. This much-coveted trophy joined the one earned by the drivers who finished the season at the head of the championship. 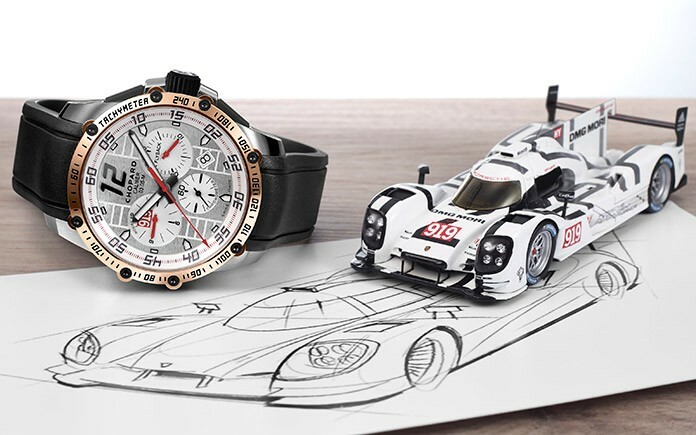 Inspired by the Porsche 919 Hybrid that powered the Porsche Motorsport to the top spot in the World Endurance Championship, the Chopard Superfast Porsche Motorsport 919 – limited victory edition celebrates the performance and the passion for automobiles shared by the two companies. Its imposing 45 mm-diameter stainless steel case is water-resistant to 100 metres. Its tachymeter-equipped bezel is crafted in 18-carat rose gold – as if to crown this victorious partnership – and secured by eight blackened screws. Its powerful lines house a high-precision mechanism with finishes reminiscent of racing car engines. The screw-lock crown is adorned with a black rubber-moulded steering wheel, while the striped sides of the case recall the cooling vents on racing engines and are matched by the linear dial motifs and the openworked movement bridges. The silver-toned dial is inspired by the famous metallic grey of the German manufacturer, whilst its stripes evoke the rear diffuser of the Porsche 919 Hybrid, and the 919 logo which appears in a red rectangle of the hours counter is identical to the numbers of the Porsche cars competing in the WEC. Much like a high-speed racing car, the bodywork of the Superfast Porsche Motorsport 919 – limited victory edition houses an engine entirely developed, produced and assembled in the Chopard workshops: the Chopard Calibre 03.05-M. This remarkable precise mechanical self-winding chronograph movement, equipped with a flyback function, is chronometer-certified by the Swiss Official Chronometer Testing Institute (COSC). 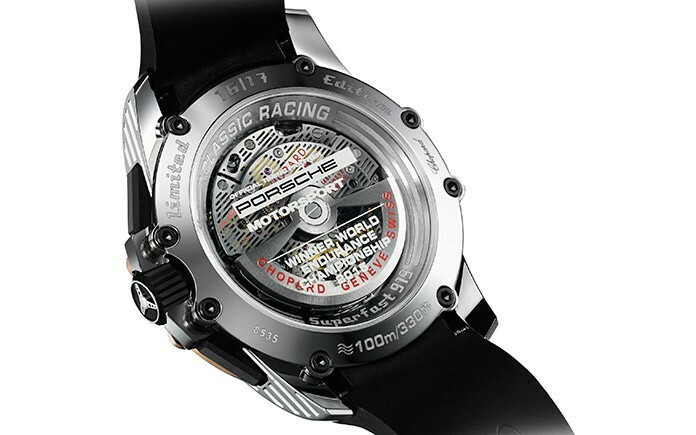 The calibre and its openworked oscillating weight are visible through a sapphire crystal engraved with the inscriptions “Official Timing Partner Porsche Motorsport” and “Winner World Endurance Championship 2015”. 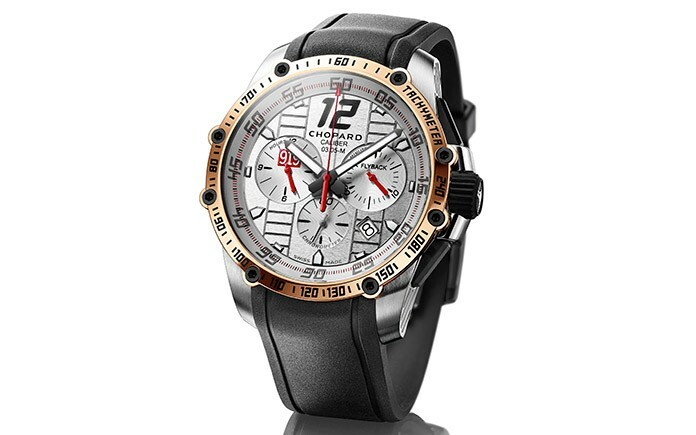 Embodying a blend of precision and performance, this timepiece exclusively available from Chopard boutiques comes with a black rubber strap inspired by slick-tread racing tyres, which notably enabled Porsche Motorsport to win the 24 Hours of Le Mans in 2015. This strap is secured by a polished stainless steel folding clasp. This watch is intended for authentic racing enthusiasts, those who share with Chopard and Porsche a true passion for motorsports.